A B-24 has lost one engine and streams smoke from another. She’s close to the White Cliffs of Dover but not out of trouble. Any second now, the last power may fail. Without enough altitude for a safe bail-out, her crew will brace for ditching and the English Channel is cold and choppy. She’s got one thing going for her—a Spitfire Mark IXB of the 403 Squadron based at Kenley-Middlesex has come to meet her and weaves above. If her pilot chooses to ditch, the Spit pilot will tell Air-Sea Rescue. When Bill did this painting, he liked it from the start. Old bomber pilots like it, too. 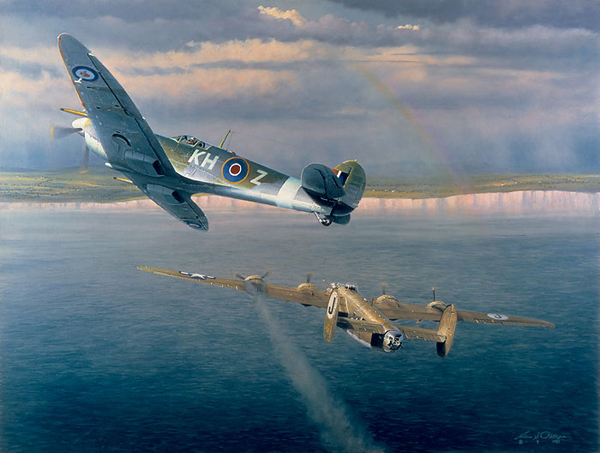 Many recalled the exact situation, the irony of struggling out of enemy skies only to go down a few miles from the home base and the joy of seeing an RAF plane coming to ride herd. Built as an interceptor, the Spitfire lacked range for escorting the bombers very far. But all agreed that the plane was a beauty and never more so than when it played Samaritan for its wounded allies.